So you just realized that you forgot to take off your shoes before going in the house right after changing the oil in your car. Whoops! Now you’ve got one of the toughest carpet stains you can get. As a professional carpet cleaner in Tampa FL I’ve seen this on more than one occasion. Don’t fret. Don’t have a nervous breakdown. I’m going to walk you through the steps to get an oil stain out of carpet. With the spatula or butter knife gently scape any oil off the surface of the carpet. 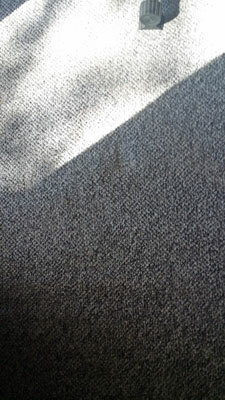 Be careful to start at the bottom of the carpet fiber and move upward. You don’t want to push it deeper into the carpet. Pour the rubbing alcohol onto your clean white towel. Gently blot the oil spot to with the towel to remove surface oil from the carpet fiber. Repeat this step two or three times to pull as much oil up as possible. Measure out 1 cup of carbonated water and pour it into the bowl. Mix in ¼ teaspoon of dishwashing soap. Trust me you don’t need much soap to do this job. Gently pour the water and soap solution onto the oil spot in the carpet. Just enough to get it wet. You don’t need to soak it. Take your clean white towel and gently bot the oil spot to remove and left over oil in the carpet. Lastly find a dry spot on your towel and place it over the spot and stand on it for about 30 seconds to remove any excess moisture. That’s how to get oil stains out of carpet. 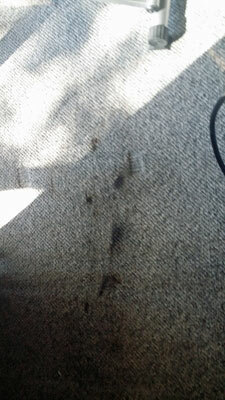 If there is any oil still left on the carpet it’s time to bring in a professional carpet cleaner to save the day. If you’re in Tampa FL Call Chem-Dry of Tampa. We know how to get tough oil stains out of your carpet. Call Chem-Dry of Tampa for your tough oil stains.